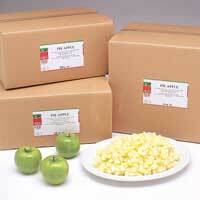 The Granny Smith variety of fresh apples are peeled, sliced or diced to create delicious apple pie fillings. Available fresh, pre-cooked and frozen. A ready to use premixed apple filling. Pre-cooked and shelf stable. A ready to use pre-mixed apple filling. Fresh and chilled.